First of all, we want to thanks Susana for making time for sharing her knowledge with us. 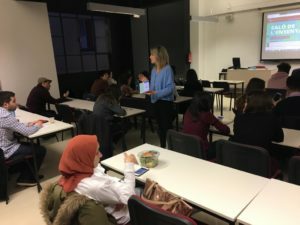 INSA International Business School organized a master class about how can we use LinkedIn in a proper way and take the most advantage of this professional platform. The speaker was Susana Jiménez, expert in HR consultancy and leadership. LinkedIn is the way to promote yourself and your personal brand, so be sure what do you want to project. Don´t forget how much you can give to the professional world but do it intelligently and correctly. And never forget: Dream big! We want to thanks INSA for giving us the opportunity of attending to this inspirational talk.